Rogue film critic Miriam Bale recently launched Joan’s Digest, an online quarterly of feminist film criticism. The kickoff party at Anthology Film Archives was wrapped around two films piloted by different Joans: first was Joan Crawford in the 1955 Female on the Beach, followed by Joan Bennett (above left) in Jean Renoir’s 1947 Woman on the Beach. The latter film is a fairly sudsy affair, lodged somewhere between a dime-store love trifecta and a fairy tale for grownups…. But Renoir is as Renoir does, and therefore it’s worth watching at least twice. Robert Ryan plays a lunk-headed (but totally earnest) Coast Guardsman still haunted by his failure to save a pal’s life in a shipwreck; Bennett is the femme fatale who woos him back to sanity (not really). 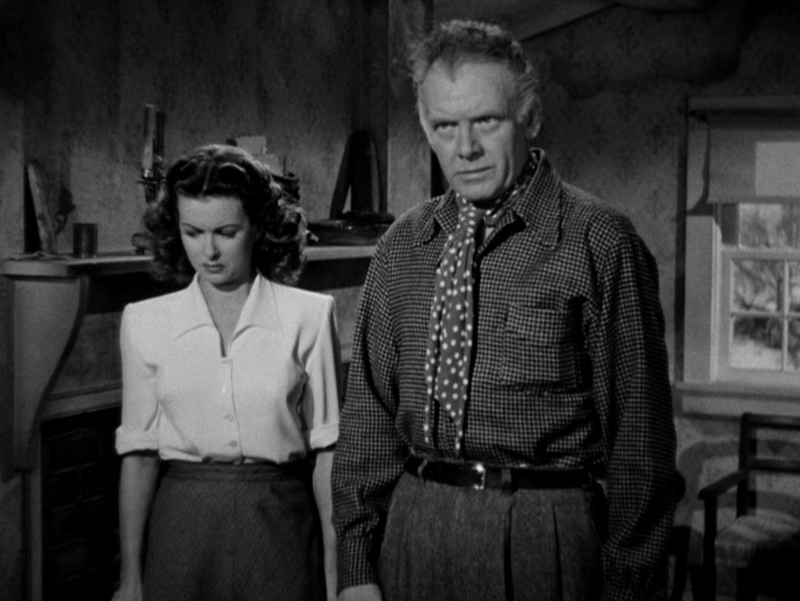 Their tryst begins, dangerously, under the nose of her blind, emotionally flammable, and considerably older husband (Charles Bickford, above right); he used to be a great painter, before a drunken fracas with Bennett’s character cost him his eyeballs. The plot is pure noir, but Woman On The Beach isn’t a potboiler. It’s worth remembering that Renoir’s father was Pierre-Auguste Renoir, and so Bickford’s painter character, while unmistakably American (“He approached the canvas like a boxer approached the ring!”) may add up to a rather personal set of ideas on Renoir’s part – ideas about art, or maybe about impermanence. (Woman on the Beach is touted more as a curio than a classic. I have no idea what the two men’s relationship was like.) Blindness is more than a mere physical condition; the harder Ryan falls for Bennett, the more he becomes subsumed by the idea that her husband is faking it, so as to keep her. Ryan’s hero complex makes it impossible for him to back off from his mission to break up the marriage; either Bickford is blind, or he is. What is it about images of waves crashing against cliffs, flash-lit by cloudy sunshine, that piqued so many great filmmakers in the 1940s? Today the motif suggests karaoke videos and R&B compilation commercials, but I’d stand this film next to Hitchcock’s Rebecca or Mankiewicz’ The Ghost and Mrs. Muir for sheer beach-gothic. My basic question is: can this movie accommodate as much introspection as a real trip to the shore? In this case, yes – the aesthetic is big enough to contain Bickford and Bennett’s curtailed dreams, as well as Ryan’s traumatized flashbacks. Whatever Renoir’s intended symbolism, it works – the beach is conceptualized as a kind of safe zone for hazy remembrances, rendering macabre and unmentionable thoughts as steady and as constant as the tide itself.